There are two categories of buttons in Captivate: text buttons and image buttons. Text buttons allow you to change the text to read anything you want, whereas image buttons cannot be changed. To add the button, go to the Tool Bar, click Interactions and choose Button. 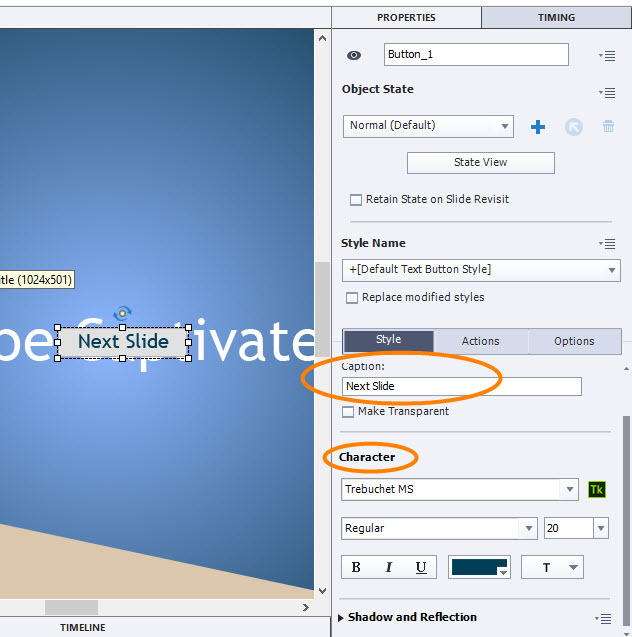 A button will be added in the center of the slide. Double-click the button to open the Properties Inspector, then click the Style tab. Change the text in the button by typing into the Caption field. Change any other stylistic options in the Character section. Click the Actions tab in the Properties Inspector, then go to the On Success menu to choose the desired action. There are also options to attach Success, Failure, and Hint captions to the button, as well as cursor and click options. Click the Timing tab at the top of the Properties Inspector. 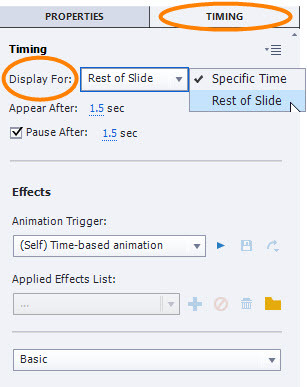 The default timing for objects in Captivate is to display for a specific time of three seconds. To change that, click the Display for menu and choose Rest of Slide. 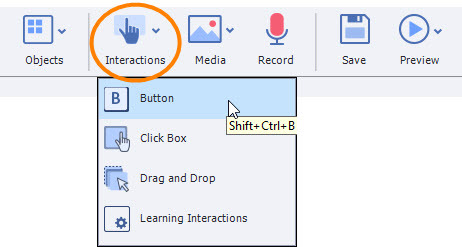 The Pause After option ensures that the learner cannot advance to the next slide until they click, so buttons are a simple and effective way to engage your audience.